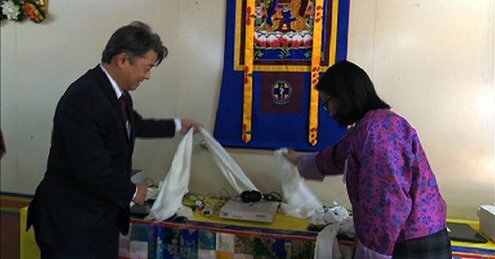 The Japanese government on Thursday donated medical equipment to the Jigme Dorji Wangchuck National Referral Hospital (JDWNRH) of Bhutan. According to reports, the received medical equipment will enhance early detection of hearing impairment and sleep apnea-a sleep disorder in the country. The medical equipment, the audio brain-stem response will help early detection of hearing impairment, the report added. Hearing impairment is found common among people living with disabilities in Bhutan for which early detection has been a challenge in the absence of appropriate equipment. Notably, JDWNRH is the only hospital that has specialized ENT treatment facilities in the country. Therefore, patients from all over the country come here for treatment. The other polysomnography medical equipment will help to treat sleep apnea, a serious sleep disorder that occurs when a person’s breathing is interrupted during sleep. People with untreated sleep apnea stop breathing during sleep resulting in an inadequate supply of oxygen to the brain and rest of the body. Japanese government donated the medical equipment under their Grant Assistance for Grassroots Human Security Projects.